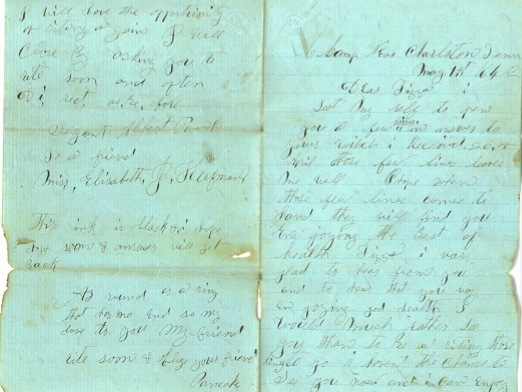 Below is the scan of a May 1, 1864, letter from Sergeant Albert Pancake, 80th Indiana Infantry, Company H, to his sweetheart and future wife, Elizabeth J. Huffman residing in Pike County, Indiana. The letter below speaks volumes about Albert’s loneliness. It was apparent that at their last meeting Elizabeth expressed to Albert her assumption that he would be married to a Southern gal by the end of the war and that there was no point to her waiting for him. Albert denies this in his response below and hints that he indeed wants her to wait for him until the war ends when they can be together. Note the uncharacteristic, for Albert, inclusion of a poem at the end of the letter. There were several love letters to his future wife, Elizabeth. 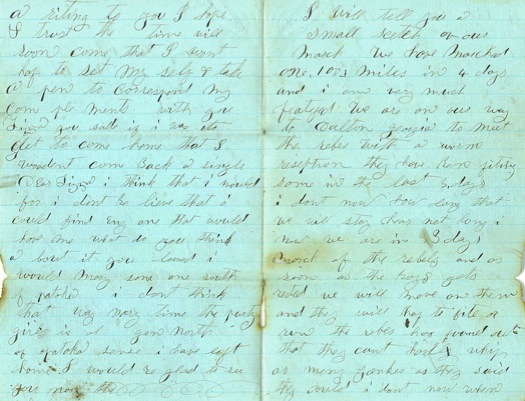 This is the only letter written on this unusual aquamarine paper. The top scan is of pages 1 and 4. The bottom scan is of pages 2 and 3 of the letter.